Perhaps nagging bone and joint issues have gotten the better of you at the gym. 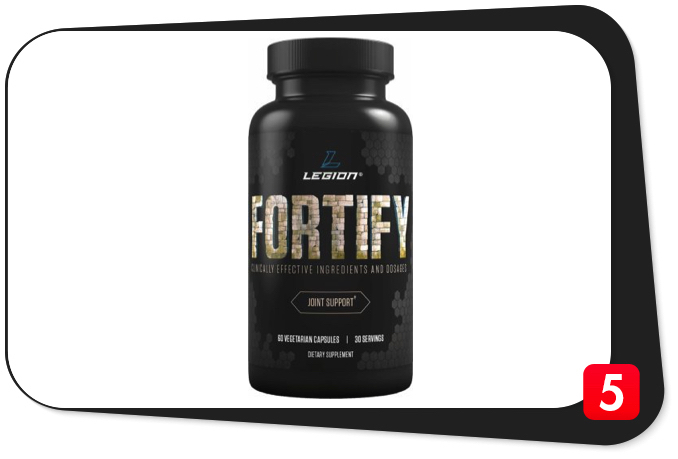 Well, this Legion FORTIFY review will show you how this supplement can help shorten your recovery time and improve your overall quality of life. Clinically-dosed ingredients. Uses same ingredient amounts researchers used in clinical studies. Comprehensive approach to inflammation. This supplement’s ingredients attacks this issue from all possible angles. Great reputation. Customers have sung this product’s praises online. OTHER INGREDIENTS: Hypromellose, Magnesium Stearate, Microcrystalline Cellulose, Silicon Dioxide. Directions: Take 2 capsules daily, with or without meals. For optimal results, take first thing in the morning. If you’re into bodybuilding and strength training, there’s a good chance you’ve had sore muscles before. Chances are, it’s a sign you pushed yourself to the limit during those strenuous workouts. These should pave the way for impressive gains down the road. However, when soreness and inflammation persist, they can set you back in a big way. First of all, you won’t be able to crank out those reps at the gym. If you don’t keep this in check, it can be a serious impediment to your progress. Good thing you can always rely on some great bone and joint supplements to regain the edge you need. One such product is Animal Flex, whose glucosamine, MSM, chondroitin sulfate, flaxseed oil, hyaluronic acid, and ginger root extract should make you feel as good as new. Another one is Jarrow Formulas Joint Builder, which includes vitamin C and vitamin D3 for better long-term health. It’s the most impressive bone and joint supplement we’ve seen to date. On that note, it would be interesting to see if Legion FORTIFY can give the competition a run for its money. This new player “is a joint supplement that supports normal joint health and function,” per its official website. Legion FORTIFY should improve your joint and bone health as well as give your workouts a much-needed boost. The company points out as many as 52 million Americans have joint issues. If this persists, “all aspects of your performance decline,” per its official website. We agree 100 percent. “Studies show that, in people with arthritic conditions, reducing inflammation and ‘teaching’ the immune system to stop attacking proteins found in joint cartilage can significantly improve joint health and function and decrease or even eliminate pain and swelling. And that’s why we created FORTIFY,” per the manufacturer’s webpage. It sure seems to us this joint supplement hit store shelves just in the nick of time. We’re confident it’ll exceed all expectations. One two-capsule serving of Legion FORTIFY yields 650 milligrams of choice ingredients which help boost joint and cartilage function. Leading the charge are 500 milligrams of curcumin per serving. Curcumin is the yellow pigment present in turmeric, arguably one of the most powerful anti-inflammatory herbal ingredients around (which explains why it’s in some post-workout supplements such as Too Fit Rally Natural Post-Workout and Vega Sport Recovery Accelerator). According to a study researchers conducted in October 2017 (via MDPI.com), curcumin “may also help in the management of exercise-induced inflammation and muscle soreness, thus enhancing recovery and subsequent performance in active people.” The simple takeaway: if you’ve been lifting for years and haven’t tried curcumin or turmeric, you’re missing out – big time. Simply put, curcumin isn’t just about its anti-inflammatory and joint health benefits. It can boost your long-term health. The knock against it is its poor solubility. That’s precisely whey the company included 20 milligrams of BioPerine black pepper fruit extract per serving. “Research shows that pairing black pepper extract with curcumin increases bioavailability twentyfold,” per the manufacturer’s official website. The company cited a study which the journal Planta Medica (via NCBI.NLM.NIH.gov) published in May 1998. For our part, we’re thrilled Legion FORTIFY has BioPerine black pepper fruit extract. Pair it up with curcumin, great things happen. “Studies show that supplementation with curcumin and black pepper extract reduces inflammatory signals in the joints and, in those with arthritis, relieves pain and stiffness and improves mobility,” per the product’s official website. Improving curcumin’s absorption is key. We’re confident BioPerine black pepper extract will do that. Once that happens, the floodgates will open – expect to fully reap curcumin’s impressive benefits. Next up are 90 milligrams of grape seed extract per serving. You may be wondering what it’s doing in Legion FORTIFY since it’s more popular as a vision supplement ingredient (it’s also in vision support products such as PRIME POINT EYE-Q and InstantVISION). However, there’s more – much more – to grape seed extract than meets the eye. “Research shows that the primary way grape seed extract helps protect joint cartilage from damage caused by the pro-inflammatory immune response that can develop into arthritis,” per the company’s official webpage. The journal Scientific Reports’ September 19, 2016 issue (via ResearchGate.net) confirms grape seed extract’s ability to ward off osteoarthritis. That’s just the proverbial tip of the iceberg – grape seed extract also helps improve cardiovascular function, regulate blood sugar levels, boost blood flow, and keep free radicals at bay. It’s an incredible inclusion in Legion FORTIFY. Make no mistake about it. The next key ingredient is acetyl-11-keto-beta-boswellic acid (from ApresFlex Boswellia serrata extract), which takes up 30 milligrams per serving. Simply known as Boswellia serrata, this component is an herb which produces an aroma known as frankinsence – a powerful weapon against inflammation. “Frankincense contains molecules known as boswellic acids. Research shows that, like curcumin, boswellic acids – and one in particular known as acetyl-keto-beta-boswellic acid (or AKBA) – inhibit the production of several proteins that cause inflammation in the body,” per the manufacturer’s official website. The company cites a study in the British Journal of Pharmacology’s February 1996 issue (via NCBI.NLM.NIH.gov). “The difference between the anti-inflammatory mechanisms of curcumin and boswellic acids is they work on different enzymes. Curcumin inhibits an enzyme known as cyclooxygenase, or COX, and boswellic acids inhibit Iysyl oxidase, or LOX (and, most notably, 5-LOX),” per the company’s webpage. It’s easy to see Legion FORTIFY takes a no-prisoners approach in terms of warding off inflammation. We like that – it bodes well for many bodybuilding enthusiasts. We hope other bone and joint supplements follow suit. Legion FORTIFY’s final key ingredient is UC-II undenatured type II collagen, which takes up 10 milligrams per serving. This is simply the protein found in connective tissue. The company takes pride in this natural ingredient. Some competitors resort to processed collagen, which has no anti-inflammatory benefits whatsoever. On the other hand, “Research shows that the UC II undenatured type II collagen is highly effective for regulating the immune response that inflames joints and destroys cartilage and bone, which further inflames the joints and starts a degenerative cycle,” per the company’s official website. It cites a study in the Journal of the International Society of Sports Nutrition’s October 24, 2013 issue (via NCBI.NLM.NIH.gov). Think of it this way: between a natural ingredient such as stevia (which helps regulate blood pressure and blood sugar levels) and a synthetic ingredient such as sucralose (which has ties to obesity), which would you choose? This should be a no-brainer. We’re stoked Legion FORITY uses undenatured collagen for healthier bones and joints. It doesn’t stop there: this joint supplement uses clinically-dosed ingredients (the same amounts used in clinical studies) for better long-term results. From a bodybuilding supplement consumer’s perspective, it just doesn’t get any better than that. All in all, Legion FORTIFY seems to cover most of the bases for a bone and joint supplement. 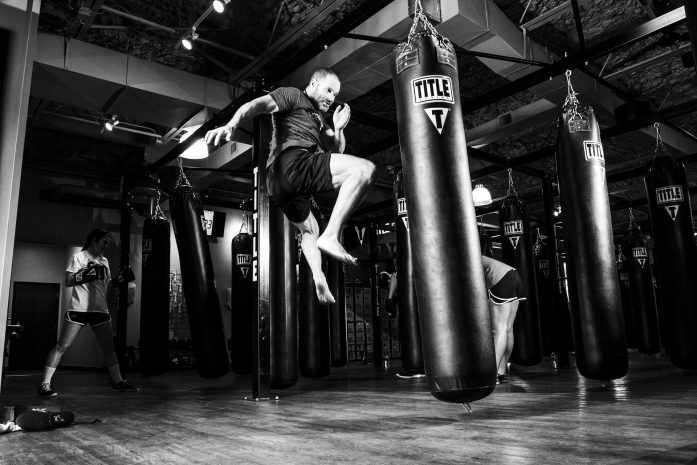 We’re confident it’ll help boost your results in and out of the gym for the long haul. Curcumin, 500 mg: This is the yellow pigment present in turmeric, an herb known for its powerful anti-inflammatory properties. Curcumin also helps enhance mood and cognitive function, boost heart and skin health, regulate the detoxification process, and increase weight loss. Grape seed extract, 90 mg: An ingredient which helps ward off inflammation and arthritis, improve vision and cardiovascular function, regulate blood sugar levels, increase blood flow, and keep free radicals at bay. Acetyl-11-keto-beta-boswellic acid (from ApresFlex Boswellia serrata extract), 30 mg: An herb which produces an aroma known as frankincense which helps keep inflammation at bay. Boswellic acid and curcumin work on different inflammatory enzymes, which means they have a complementary nature. BioPerine black pepper fruit extract, 20 mg: An ingredient which helps improve the bioavailability of many bodybuilding supplement ingredients, including curcumin (which has poor absorption prowess). Black pepper fruit extract pairing up with curcumin increases the potency of the latter significantly. UC-II undenatured type 2 collagen, 10 mg: The protein found in connective tissue which helps regulate the immune response which has detrimental effect on joints, cartilage, and bones. Legion FORTIFY features undenatured collagen, which produces better results than the processed version. The manufacturer considers Legion FORTIFY “The Most Powerful Supplement For Joint Health.” After a thorough analysis, we say it’s powerful. However, it doesn’t make us jump out of our seat. It doesn’t have the strongest bone and joint formulation we’ve seen – the likes of Jarrow Formulas Joint Builder and Animal Flex take it to a different level. Nonetheless, Legion FORTIFY still holds its own. If you drink turmeric tea, you’ll swear by its anti-inflammatory effects which shorten recovery time at the gym. This supplement’s curcumin component (500 milligrams per two-capsule serving) gives you that impressive benefit. It also helps enhance mood, improve cardiovascular function, and boost detoxification. The manufacturer is one step ahead of the competition – the former includes BioPerine black pepper fruit extract (20 milligrams per serving) which improves the curcumin’s poor bioavailability. Like we said, that improves the potency of curcumin significantly. We hope other bone and joint supplements follow suit. The inclusion of 90 milligrams of grape seed extract was also a stroke of genius – this ingredient helps inhibit the inflammatory immune response which may result in arthritis. It’s also an excellent vision supplement ingredient. Grape seed extract’s other benefits include better heart health and blood sugar levels, improved blood flow, and increased protection against free radicals. When you throw in 30 milligrams of boswellic acid per serving, great things happen. This is yet another underrated inflammation buster. The tandem of boswellic acid and curcumin help keep inflammation at bay from all possible angles. We like the manufacturer’s aggressive approach. The 10 milligrams of UC-11 undenatured type II collagen per serving is your proverbial icing on the cake. You can find this ingredient in many bone and joint supplements. However, many competitors resort to the processed type of collagen, which is useless. We’re glad Legion FORTIFY doesn’t do that. We also laud the manufacturer for using clinically-dosed ingredients. Remember, these are the same amounts researchers used in their clinical studies. You can be sure you’ll reap the maximum benefits. That’s awesome, to say the least. Legion FORTIFY also excels in the transparency department – the company reveals all of the ingredient amounts. You also won’t find any fillers or dirty ingredients in this bone and joint supplement. We give that a huge thumbs up. In terms of reputation, many customers have raved about Legion FORTIFY – they say it exceeded their wildest expectations. On the other hand, a few customers say this product didn’t work for them. Fortunately, they’re in the minority. You’ll be pleased to know Legion FORTIFY has no glaring weaknesses – it has excellent formulation, transparency, and reputation. Like we said, it’s not the most powerful in this product category, but you can be sure it’ll give you the results you want. Legion FORTIFY “is a 100 percent natural joint supplement that improves your joint health and function by reducing inflammation and preventing cartilage loss,” per the manufacturer’s official website. The manufacturer intended Legion FORTIFY for healthy and active individuals who want to improve bone, joint, and cartilage health; shorten recovery time, improve their overall quality of life, and achieve their daily fitness goals. While Legion FORTIFY has no glaring side effects, please consult your doctor if you feel doubtful about any of its ingredients. Impressive formulation. Features non-traditional bone and joint supplement ingredients which deliver maximum results. Curcumin content. The yellow pigment of the turmeric plant, which is arguably one of the best in warding off inflammation. BioPerine black pepper extract. Improves the bioavailability of curcumin significantly. Comprehensive approach to inflammation. Curcumin and boswellic acid components attack inflammation from every angle. Excellent transparency. Manufacturer breaks down all of the ingredient amounts. No fillers. You won’t find any dirty ingredients here. Great reputation. Customers have given this product high marks online. Potency. Some customers say it didn’t work for them. However, they’re in the minority. Perhaps your bone and joint issues have gotten the better of you at the gym. It doesn’t have to be that way – making a product such as Legion FORTIFY part of your supplement arsenal can work wonders. All in all, this is a top-notch bone and joint supplement which should help shorten your recovery time and improve your overall quality of life. We highly recommend you buy it and feel the difference it will make.